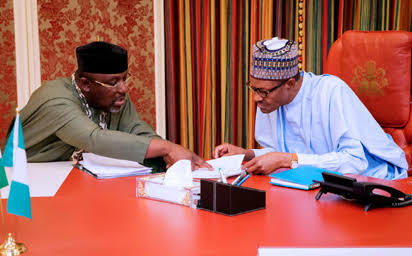 Imo State Governor, Rochas Okorocha, on Thursday said the All Progressives Congress (APC) governors met with President Muhammadu Buhari to find a solution to the crisis that has engulfed the party in its ongoing primary elections. Okorocha is one of the governors facing internal opposition in his state because of his decision to support his son-in-law, Uche Nwosu, to take over from him. He led seven of his colleagues to meet Buhari in his office on Thursday. The meeting lasted for over one hour. The governor continued, “So, we are looking for a way out in this regard. We are going to find solution, our party believes in justice, equity, and fairness. “We are requesting that let the right thing be done and let everyone contest the elections,” he said. Some of the governors at loggerheads with the Adams Oshiomhole leadership apart from Okorocha are Abdulaziz Yari of Zamfara and Ibikunle Amosun of Ogun. Other governors who attended the meeting with Buhari are Rotimi Akeredolu of Ondo, Abubakar Bello of Niger, Atiku Bagudu of Kebbi, Abiola Ajimobi of Oyo and Simon Lalong of Plateau states. The governors are insisting on having their way otherwise they won't be comfortable to work for APC when the Governorship candidate is not their choice.